The AV8x1P is a passive 8 channel combination stereo audio and video switcher. The use of a high quality switch allows for clean switching of audio and video. The switching function is audio follow video (both audio and video are switched simultaneously). The audio connectors are phono (RCA) type; the video connectors are BNC. 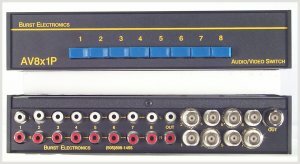 The AV8x1P is the 8-channel version of the AV4x1P. The AV8x1A includes all the features of the AV8x1P plus an audio monitor amp. The internal stereo audio amplifier (2x3.5W), with volume control, is suitable to drive headphones or mini-monitor speakers.